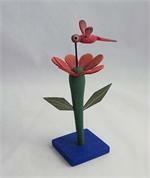 Oaxacan wood carving - flower with hummingbird by the Torres-Ortiz family: 7" high by 4" wide by 3" long. 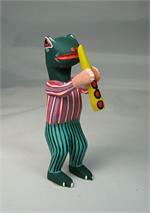 Frog with clarinet signed by Oaxacan artist, Xuana: 5" high by 2" wide. 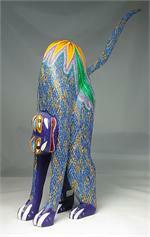 Large Oaxacan stretching cat signed by artist, Sergio San Liago: 15" high (with tail) by 5" long by 3" wide.